Northwestern State senior Kelsey Frank’s collegiate athletic career is coming to a close, with her final home regular-season appearance Friday afternoon as a highlight, but she isn’t leaving sports any time soon. After she graduates in May, she will be staying at NSU to get her master’s in sports administration. Frank competes Friday in the Leon Johnson NSU Invitational track and field meet at the Walter P. Ledet Track Complex. Admission is free. 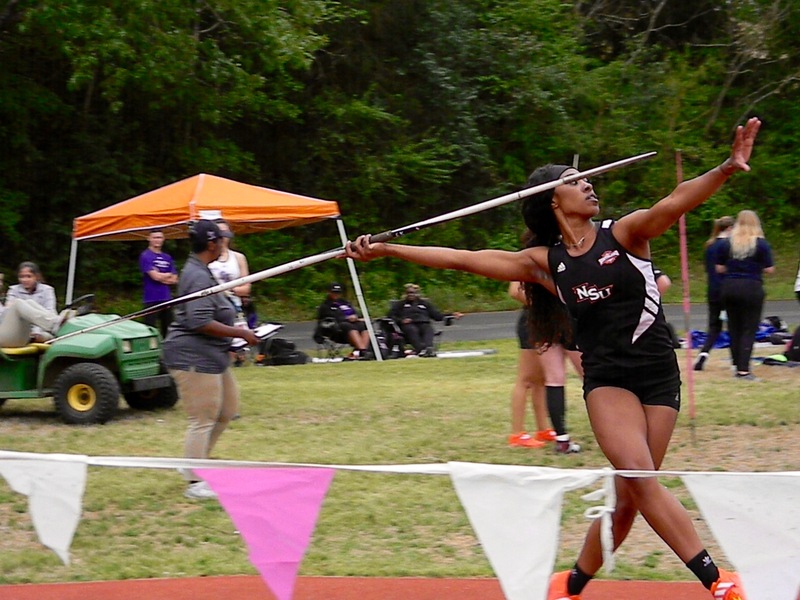 Her event, the javelin, will be contested at 2 p.m. inside the track oval. Frank joined NSU’s women team in fall 2014 as a two-time state champion javelin thrower at Oberlin High School. She had never thrown 130 feet, mostly because she was a raw talent who hadn’t received any significant technical coaching. In her freshman season she participated in seven meets and finished top-five in six of them. Her best mark was at the Leon Johnson NSU individual where her throw of 155-0 was fifth all-time in Lady Demon javelin history and ranked her fourth in the Southland Conference. It was nearly a 30-foot improvement over her best mark at Oberlin High, and earned her a trip to the NCAA East Preliminary Round as the 28th-best thrower among 48 qualifiers. She fouled twice on three attempts at that high level and finished 44th, not a bad performance for a rookie. She was impressive in her sophomore season, again qualifying for the NCAA East Preliminaries, where she entered with a 34th place seed but finished 15th with a season-best 152-5, after taking home the bronze in the SLC Outdoor Championships. She threw her personal best of 156-3 to win at the 2017 SLC Outdoor Championships, but wasn’t pleased with how it ended, with a 129-8 mark at the NCAA East Preliminaries. She redshirted her following season to better herself as an athlete. She’s proved that she’s performing better in her senior season. She’s currently the top women’s javelin thrower in the Southland Conference with the top three marks in the conference, all at least 154-7 topped by a 156-4 at the Texas Relays. She plans on breaking the 20-year-old school record of 166-9 by All-American Regina Roe before her season ends, and would like to make that move Friday at the Leon Johnson NSU Invitational.